What is 100 Rotarians Who Care? This is an innovative approach to Rotary fundraising. 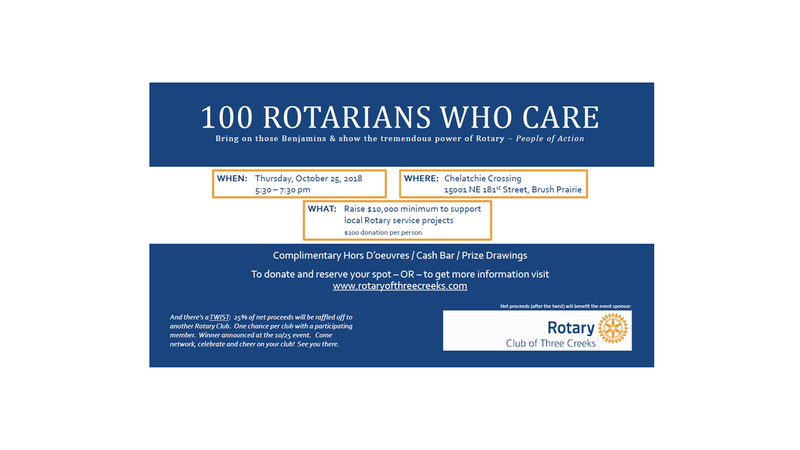 It is a fundraiser for the Rotary Club of Three Creeks’ service projects, to raise money for End Polio Now, and an opportunity for another Rotary Club to take home 25 percent of the total funds raised! The goal of the event is to gather 100 Rotarians who each donate $100. The impact of coming together to raise a minimum of $10,000 provides an ability to change a community. Thursday, October 25 at Chelatchie Crossing Smokehouse & Saloon, 5:30-7:30 p.m. Hot appetizers will be provided, and a cash bar will be open. Prizes will be given away at the event - you must be present to win! On the night of the event, we will know the total donation amount and announce it, and present checks. 50 percent of the total funds raised will go to the Rotary Club of Three Creeks for its service projects (specifically Basic Education and Literacy). 25 percent of the total funds raised will be donated on behalf of ALL participating clubs to The Rotary Foundation Polio Plus account, to help End Polio Now! And here’s the exciting part for your club … 25 percent of the total funds raised will be awarded to a Rotary Club chosen at random during the event! When you arrive at the event, you’ll be given a raffle ticket. At the end of the event, we’ll draw one or two lucky raffle tickets for big prizes - stay tuned as these are announced! Your club could also stand to earn a portion of the proceeds! What happens with the money raised? During the 2018-19 Rotary year, we will inspire leadership by launching a new Interact Club in a local high school. During the 2018-19 Rotary year, we will inspire learning and promote reading by expanding our efforts to contribute service toward Basic Education and Literacy (one of Rotary’s Six Avenues of Service). Since our charter in October 2016, we have completed 20 service projects. Our service focus has been on Peace & Conflict Resolution, Veterans programs, and assisting individuals and non-profits in need of help. We will also continue to serve Veterans, promote peace & conflict resolution and our assistance to individuals and non-profits that need help. First & third Thursdays 5:30 p.m.